415 W. 8th St., Hinsdale, IL. We invite all Rotary Members and those who may interested in learning about, or becoming a member of Rotary, to join us for our weekly meetings and programming. Visiting Hamburg, Germany with the Culvers! April 19, 2019 - Anke and Lowell Culver presented a personal review and discussion on the City of Hamburg, Germany where the 2019 RI Convention will be held this June. Anke grew up just to the north of Hamburg on the North Sea and told of her remembrances of WW II in the Hamburg area, and how the city has recovered from that period. Lowell told of his first trips to Hamburg for the US government in the early 1950's and of meeting Anke there. Lowell and Anke will host a reception at their Hamburg home for Hinsdale Rotarians who will be in city for the RI Convention and also will lead the Hinsdale delegation to Hamburg restaurants and a lake cruise, May 31 thru June 5. A Rotarian is an ordinary person who wants to do something extraordinary…to rise above the daily routine…to make a difference in a community and the world. A Rotarian is an ordinary person who takes on small tasks with unusual enthusiasm. A Rotarian is an ordinary person who has a vision of the world at peace, brought about by goodwill and understanding. 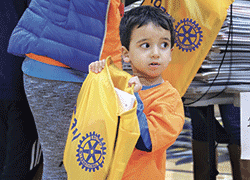 A Rotarian is an ordinary person who sees three million children each year die from disease and asks: Why? A Rotarian is an ordinary person who sees 1,200 Rotary Foundation scholarships awarded each year and asks: Why not more? A Rotarian is an ordinary person who believes that truth is a difficult and worthy pursuit. A Rotarian is an ordinary person who acts not out of convenience but out of conviction. A Rotarian is an ordinary person who believes that “Service Above Self” is more than an ideal. It is a belief that transforms an ordinary person into an extraordinary member of the world community. 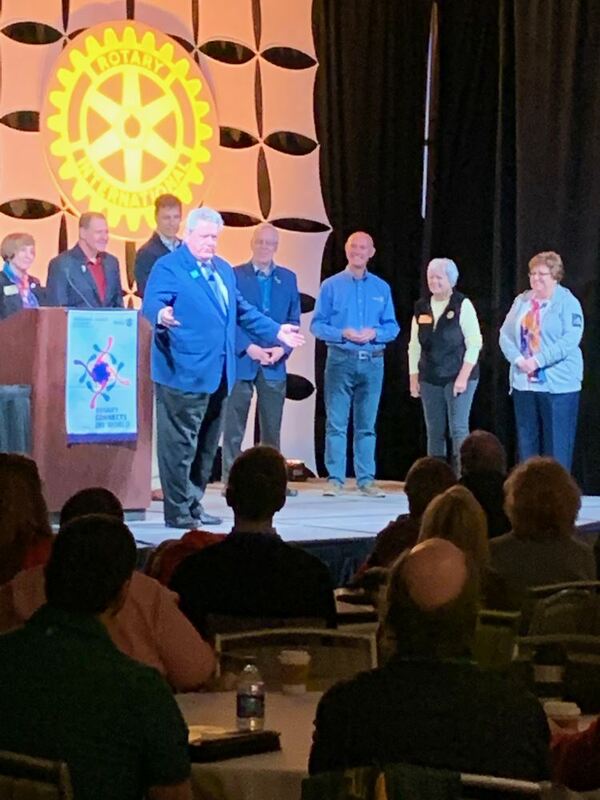 March 11, 2019 - Incoming Rotary International President, Mark Maloney, appeared at the Burr Ridge, IL Marriott to address new President-Elects and local Rotary Club members. About 200 hundred attended the evening event. 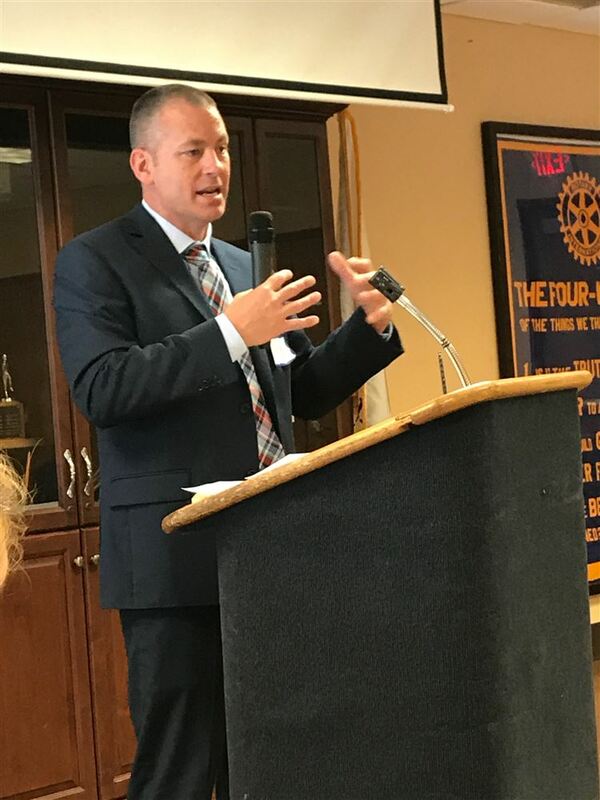 Hinsdale Rotary was well represented with 10 members participating and all were inspired by Mr. Maloney's thoughts on new membership, programming, and the goals of Rotary SaveInternational. Incoming RI President, Mark Maloney, addresses local Rotarians at the Burr Ridge Marriott, March 11th. Hinsdale Rotary Member, Fred Glinke, Owner of Glinke Plumbing, has sold his business and is moving to Daytona Beach, FL. 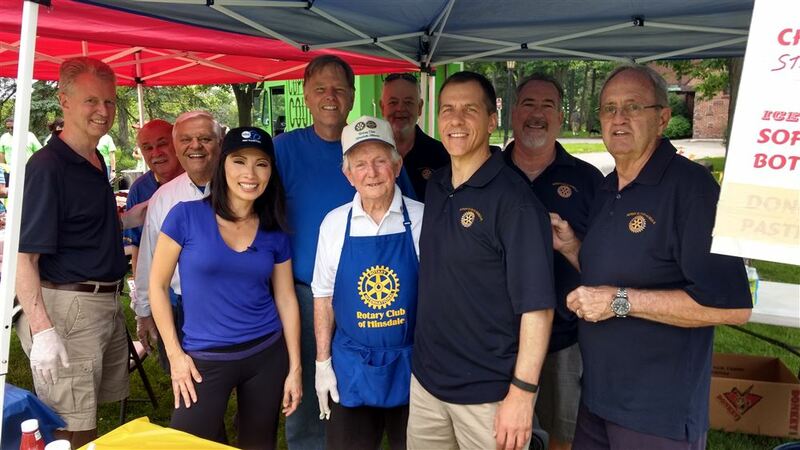 Fred has been a member of Hinsdale Rotary for 43 years. On Friday, February 22nd, Hinsdale Rotary made Fred an Honorary Member and looks forward to seeing during his visits back to Hinsdale from his new home in Florida. Good luck and best wishes, Fred! Laith Khartabil, Grace Epstein, Clarendon Hills MS; Lauren Priest, Hinsdale MS; Jame Curto, President Hinsdale Rotary; Olivia Kreischer, Hinsdale Central HS; Mehlum Anjarwala, Hinsdale MS; Eric Miscimarra, Hinsdale Central HS. 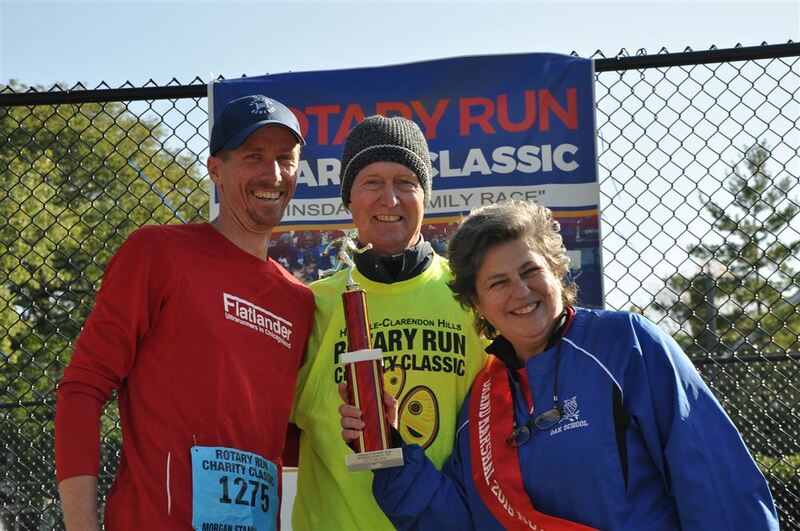 All recipients also received complimentary registrations to next fall's 25th running of the Hinsdale Rotary Run Charity Classic, Oct. 6th, 2019. 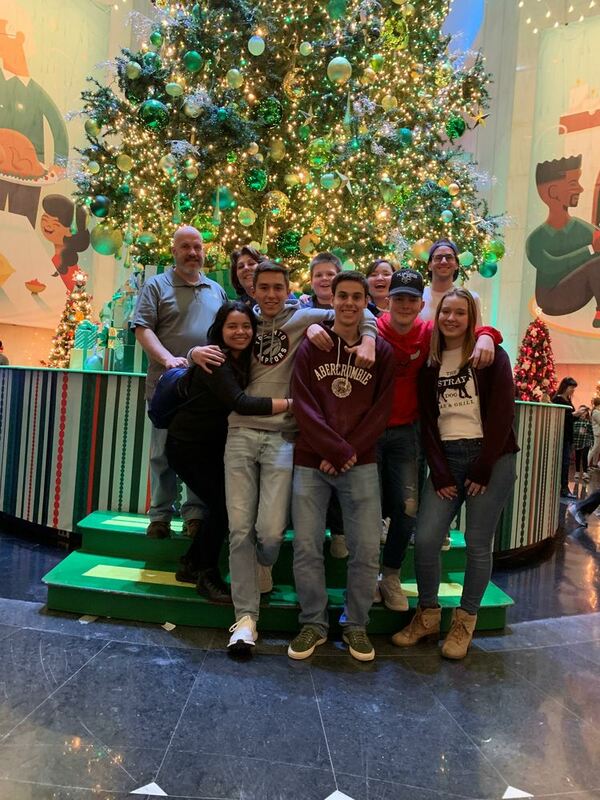 Cheri Vana leads seven of the District 6450 Foreign Exchange Students to the Chicago Museum of Science & Industry. 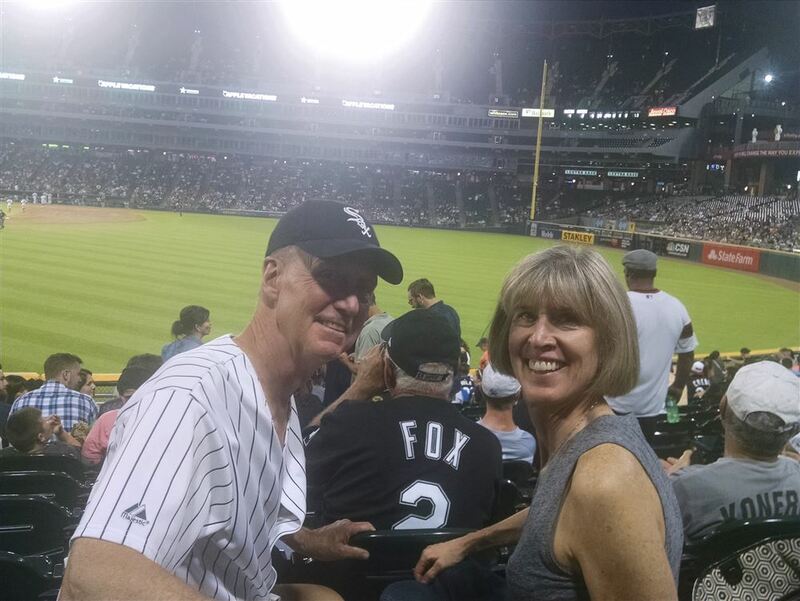 This has become an annual trip organized by Member Tom Norton. 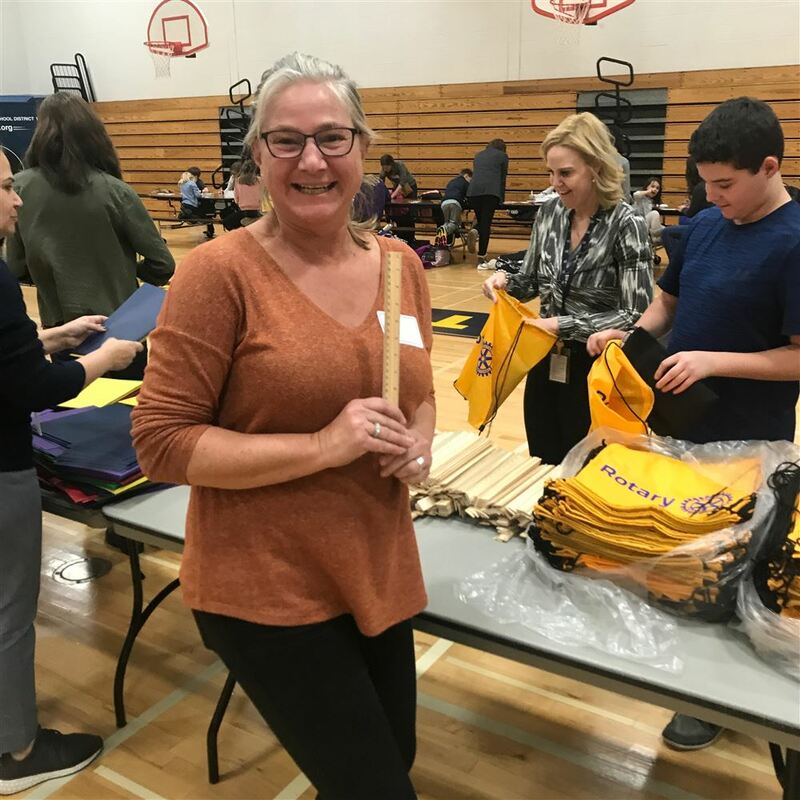 The afternoon of Nov. 15th, members of the Hinsdale Rotary Club helped hundreds of School District 181 students and staff load up 1,000 school bags full of supplies -- in only 60 minutes! The bags will be shipped to Robeson County, NC where Rotarians from the Lumberton, NC Rotary Club will help the Robeson County School District distribute the supplies and bags. 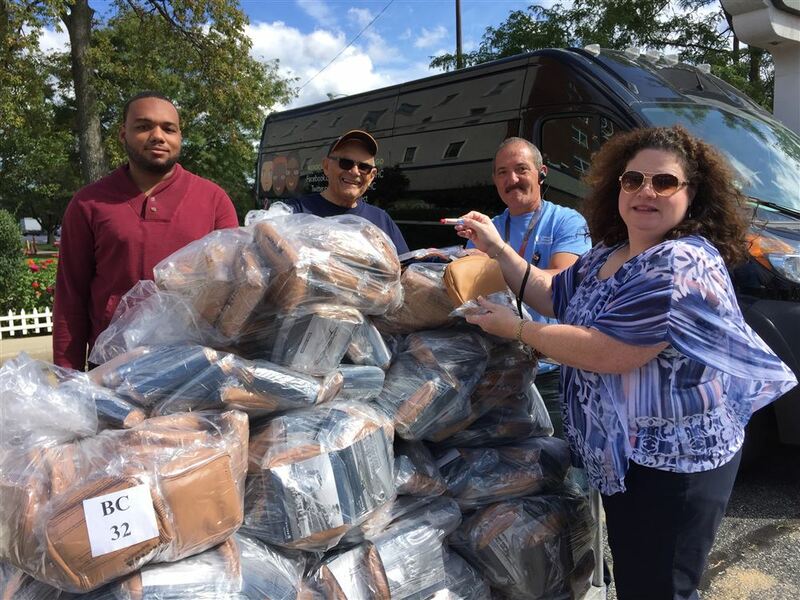 Special thanks to the Rotary Clubs of Naperville that gave a big assist to our Hinsdale Club in this effort and also to Cadence Premier Logistics of Joliet, IL for providing the truck that will deliver the supplies to Lumberton. Cadence is estimating that the school supplies will be in Lumberton before Thanksgiving. Community Consolidated School District 181, The District 181 Foundation and the Hinsdale Rotary Club are coming together in a community effort to support the devastating losses incurred by the Robeson County, North Carolina School District during Hurricane Florence. To support our fellow educators and students, we’re asking our communities to donate school supplies from now to November 14th. November 12-16 is National Education Week, a fitting designation for our schools to show that we have a heart for high-quality education not just in our own communities but nationwide. Donations of goods or cash will be collected at all D181 schools during school hours and at drop-off sites throughout the community. Cash donations can also be accepted online at www.d181foundation.org. Click on the donate link by the Care for Carolina event on the homepage. All cash donations will be used to purchase school supply items. Our goal is for D181 schools to fill 1,000 book bags with school supplies that are deeply needed by Robeson County schools. Schools are being asked to collect the following items, which will then be packed into backpacks and shipped to North Carolina. The drive will culminate with a volunteer event on November 15th at CHMS from 3:30-6:30 where the supplies are packed up and loaded into a truck that will take them to Robeson County. Rotarians are asked to volunteer, along with the District 181 students, in assembling the book bags on November 15th. A sign up sheet will be available at our Friday Club meetings. 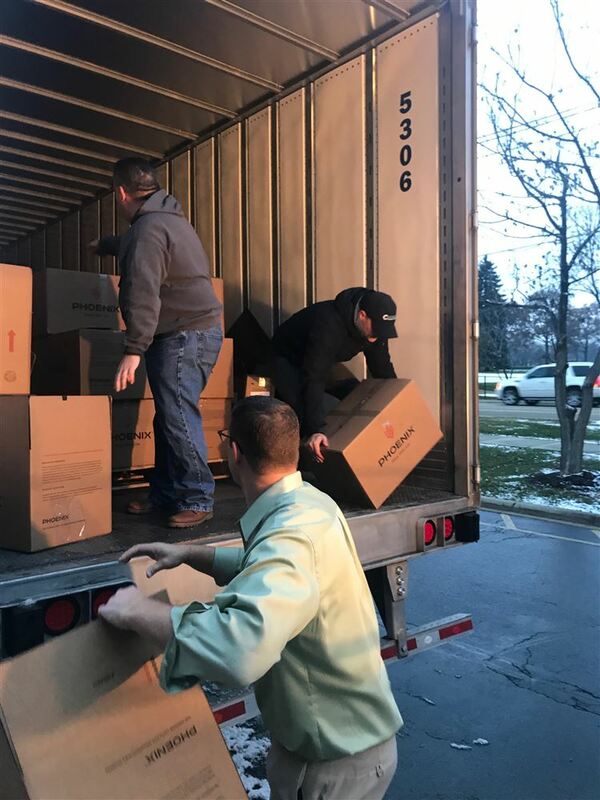 The logistics and truck were made possible through a partnership between the Rotary Club of Hinsdale, The Rotary Club of Naperville, The Rotary Club of Lumberton, NC, and Cadence Premier Logistics. The District 181 Foundation is providing “Kids Grants” to D181 students to encourage them to use their ingenuity in reaching their collection goals. Retiring Oak School PE Teacher, Marianne Biedrzycki, (second from right) was recognized by School District 181 for 20 years of collaboration with the Hinsdale Rotary Run Charity Classic. 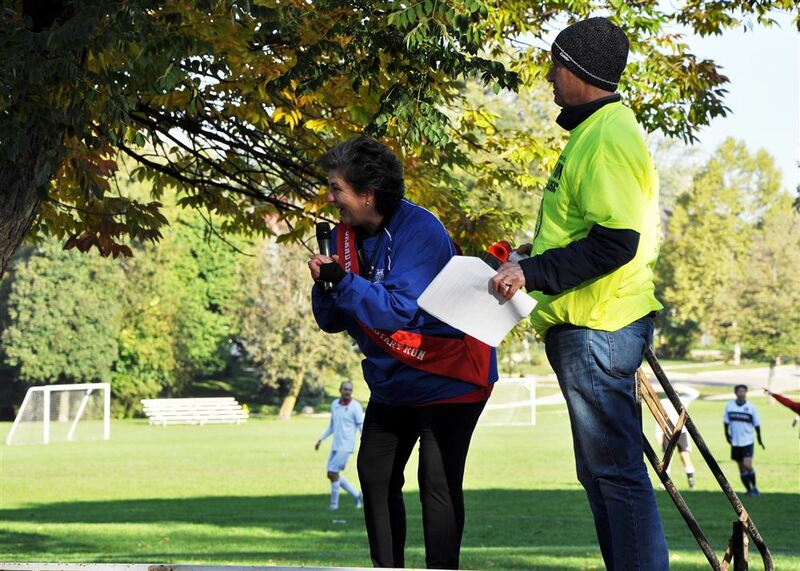 "Mrs. B" was instrumental in recruiting many students and families to participate in the run since 1998. 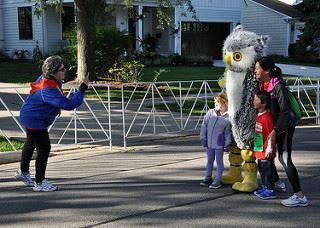 Mrs. B also served as the Grand Marshal of the 2018 Hinsdale Rotary Run Charity Classic and oversaw a very successful race! Also pictured on the right of the shot is new, incoming Hinsdale Rotary Member, Dr. Hector Garcia, Superintendent of District 181. 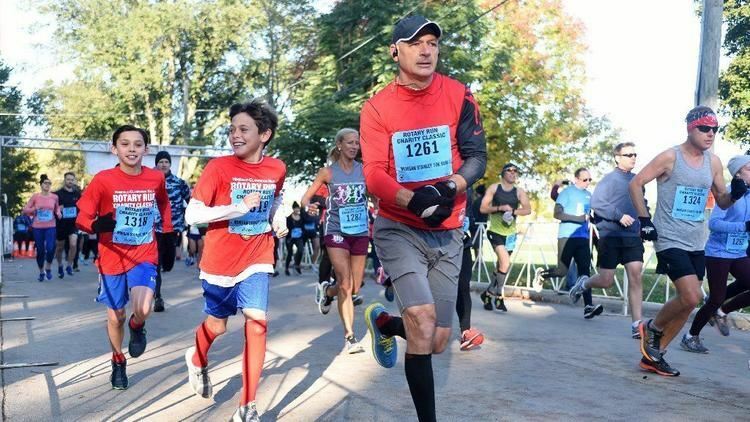 Sunday October 14th dawned as a clear, crisp autumn day with more than 700 runners joining in the fun surrounding the 24th running of the 2018 Hinsdale Rotary Run Charity Classic. 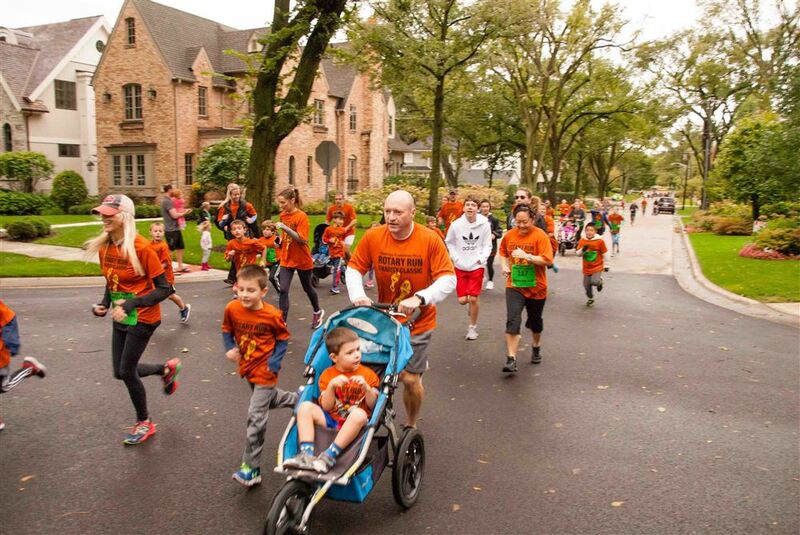 "Hinsdale's Family Race" did not disappoint in any way! The CARA certified 10K race got off promptly at 8:30AM with the 5K and 3K races stepping off shortly afterwards. 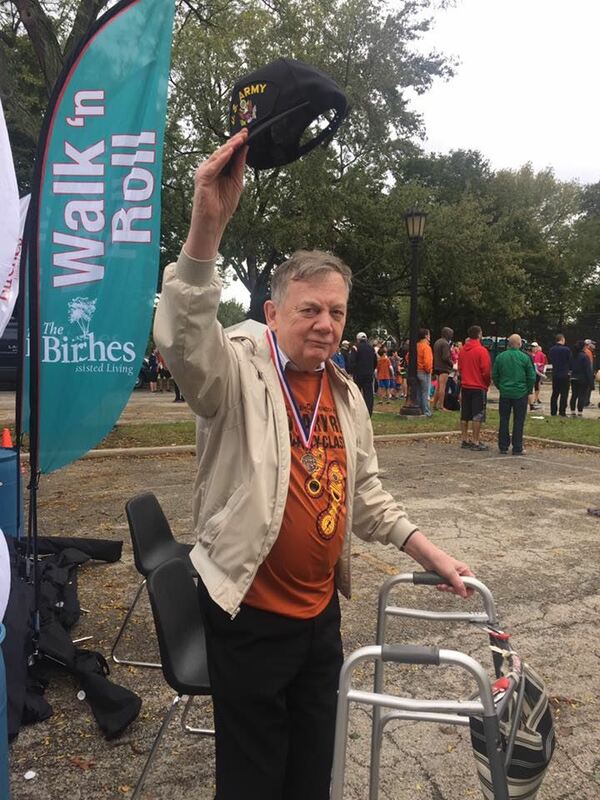 Following the running races came the 5K and 3K walks, The "Walk and Roll", and finally, The Mutt Strut. 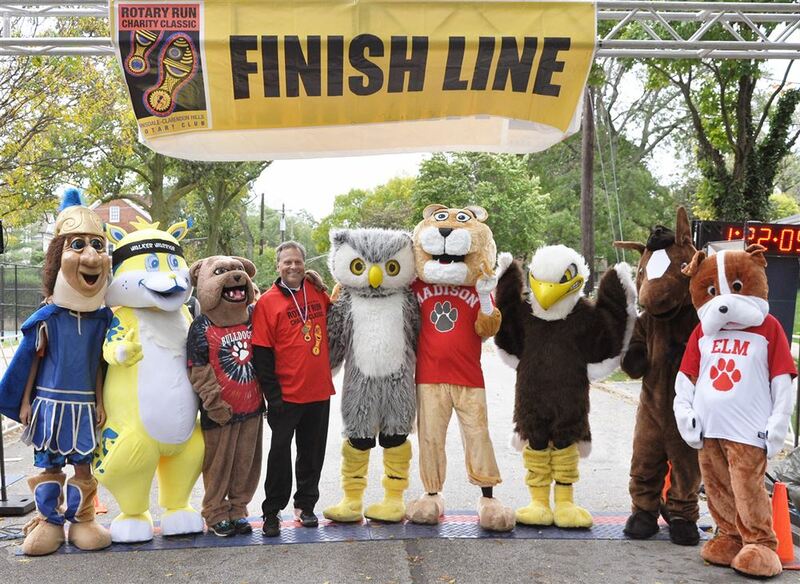 The "World Famous" District 181 Mascot Race rounded out the competition this year. 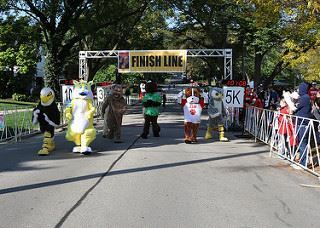 "Bowser" the Mascot of the Elm School Bulldogs bested the very tough field of 8 mascot racers. 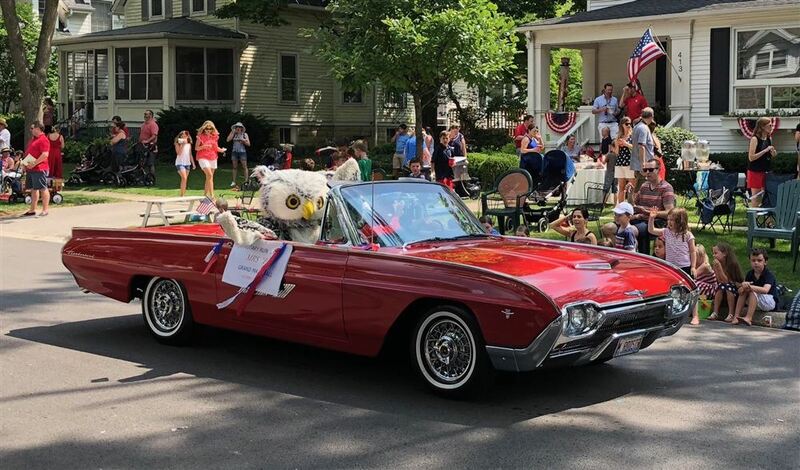 This year's race was overseen by Grand Marshal, Marianne Biedrzycki, (Mrs. B) who has urged her students in Oak School PE classes to register and run in the annual event for 20 years. 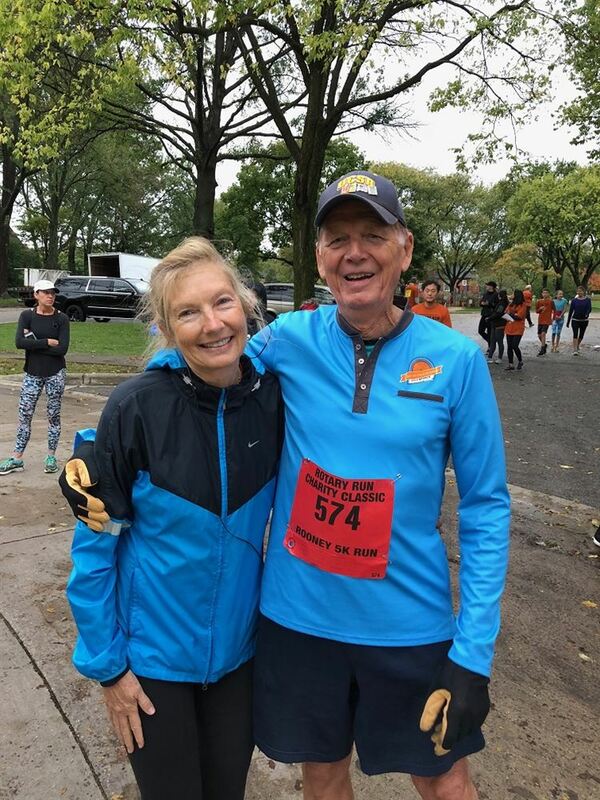 Hinsdale Rotary believes Marianne is responsible for thousands of registrations of kids and their families in the Rotary Run -- and salutes "Mrs. B" for her service and dedication to her students and school as she prepares to retire in 2019. 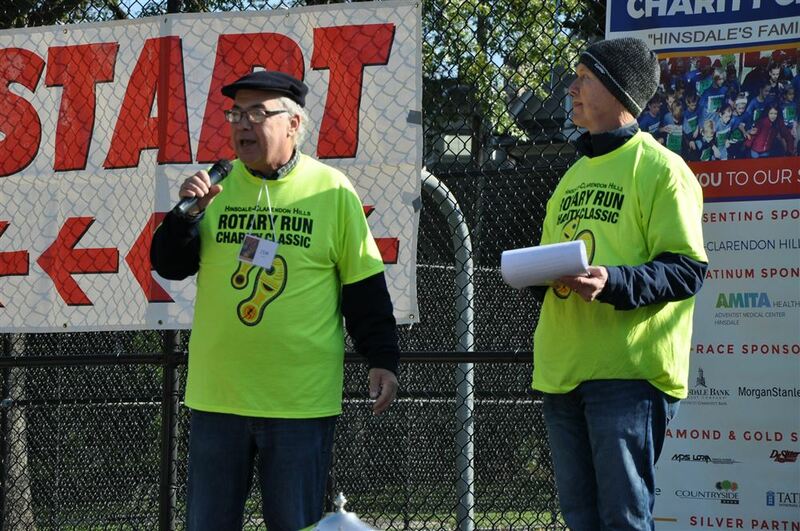 An estimated $80,000 was raised by this year's edition of the Rotary Run and will be donated to the The Hinsdale Hospital Foundation, the Ray Graham and Hanson Center Foundation, The District 181 Foundation, The Community House of Hinsdale, and the Hinsdale Rotary Club Foundation. 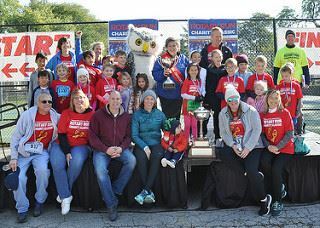 Over the 24 years that the race has been run, the Rotary Run has raised over $2,000,000 for local charities in and around Hinsdale. 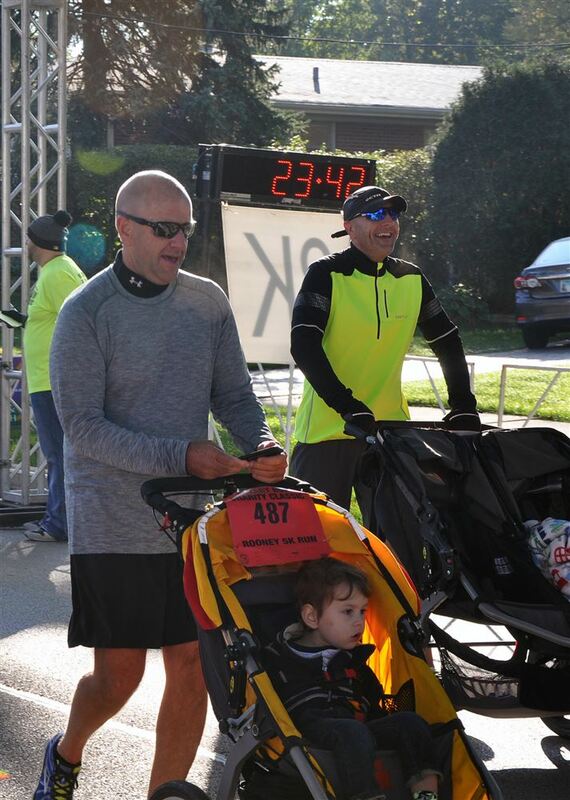 The Hinsdale Rotary Run Charity Classic is made up of runners from every level, of every running interest. 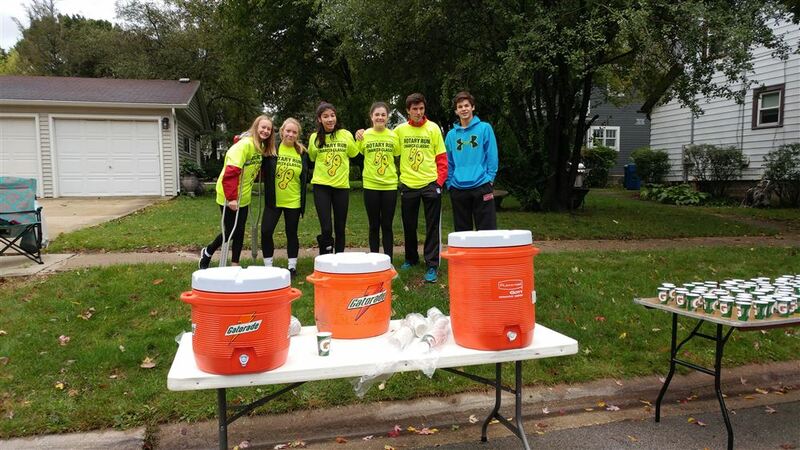 At its heart, it is "Hinsdale's Family Run"
Those on the sidelines, cheer the runners on! Ed Scheer, Men's 10K Champ...and Women's 10K Champ, Rebecca Cozzi, with Tom Norton and "Mrs. B"
Oak School Wins the 2018 "Mrs. B" Trophy! 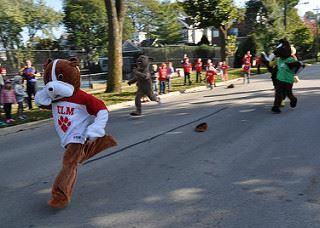 The Mascot Race is won, pulling away, by "Bowser", School Mascot for the Elm School Bulldogs! Thanks to Jamie Laviguere, District 181 Communications Director for the use of her pictures in this presentation. 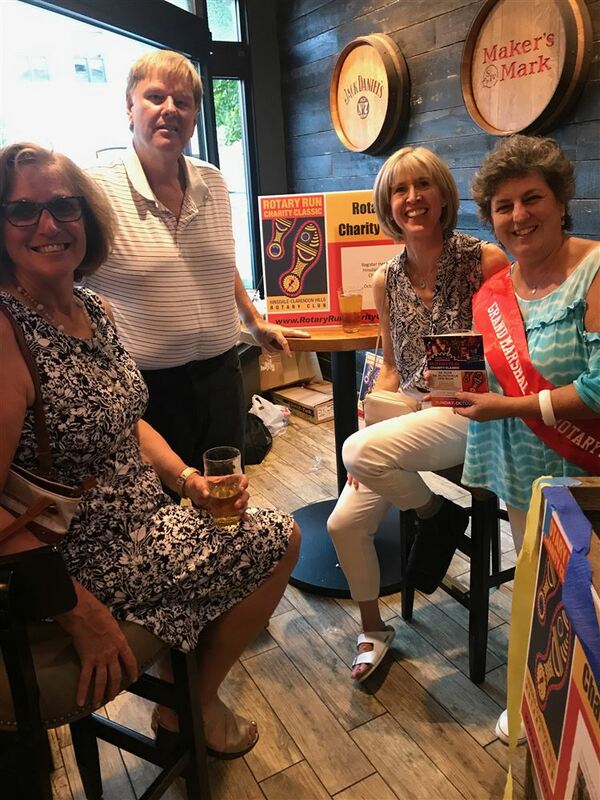 Hinsdale Rotary worked hard to get as many people as possible to patronize The Fuller House Bar and Restaurant on Monday evening, Aug. 27th, 6-9pm. Why did the club do this? 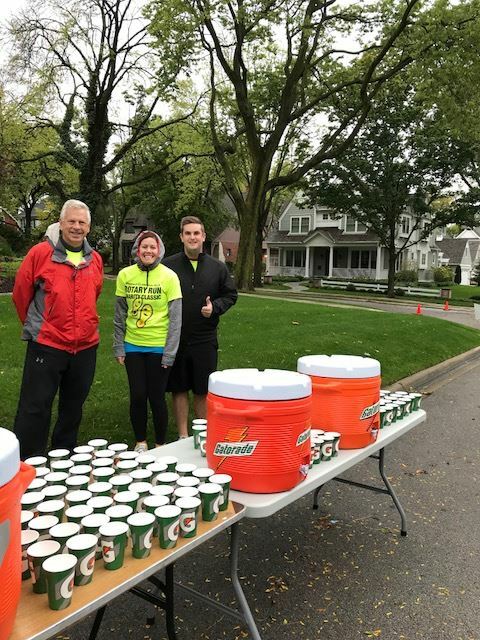 The Hinsdale Rotary Run Charity Classic was to receive 10% of the proceeds from all food and drink sold that night at the Fuller House and the more people who came, the more benefit for the race. As it turned out, it was a good night at the Fuller House. 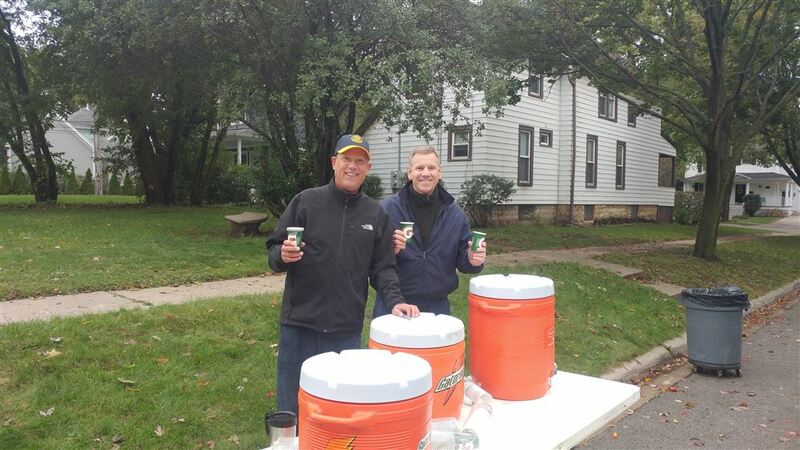 Dozens of people came out and in the end, the Hinsdale Rotary Run netted about $400.00 towards the total sponsorship of the Oct. 14th race. 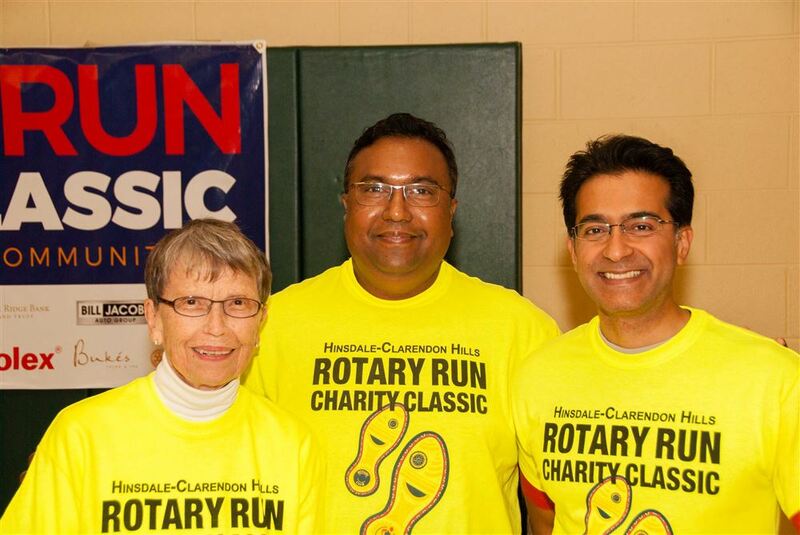 A great night, with good food and drink, all for a great cause -- The 2018 Hinsdale Rotary Run Charity Classic! 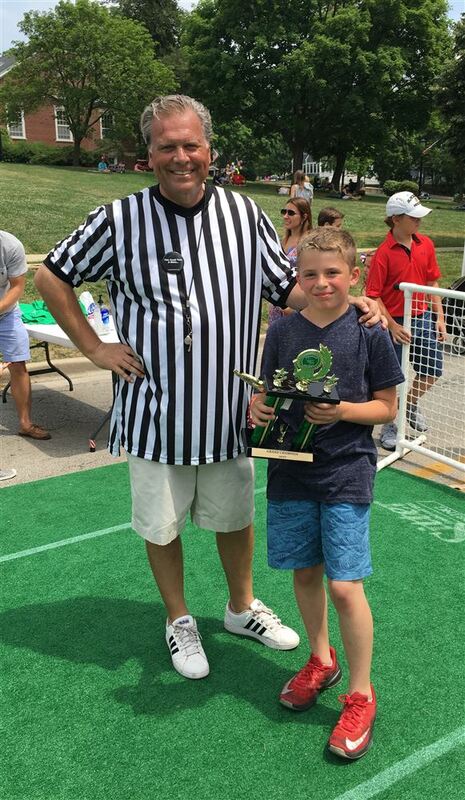 The Annual Hinsdale Rotary "Turtle Races" --- Rotary Turtle Race Chairman, Greg Donnelly, with Gabriel, the overall Champion "Turtle Whisperer"! 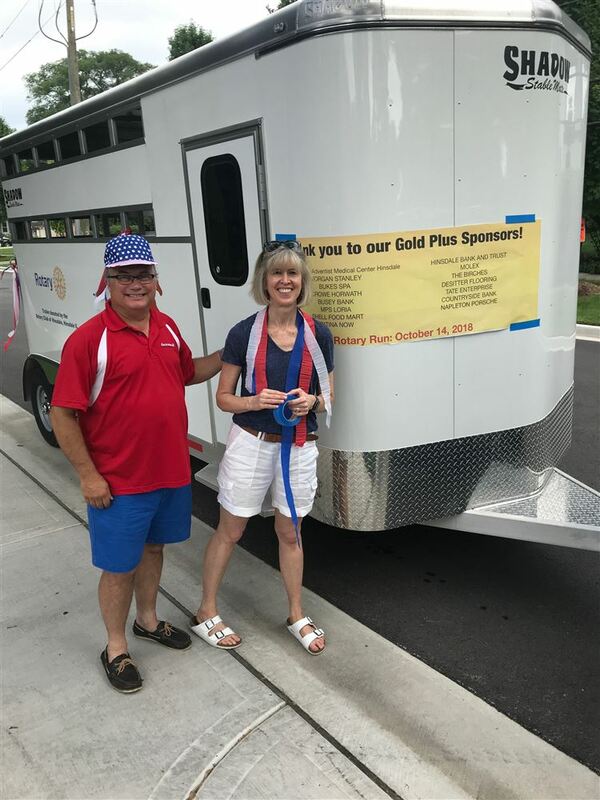 ...And the Hanson Center Horse Trailer donated to the organization by Hinsdale Rotary. Over 25 thousand Rotarians from all over the world gathered in Toronto for Rotary's 109th Annual Meeting. Hinsdale Rotary sent a delegation of nine (six Rotarians - Bob Parsons, Jim Curto, Cheri Vana, Chuck and Carolyn Snyder, & Tom Norton) and three spouse/guests to the event which included key addresses from Justin Trudeau, Canadian Prime Minister, former First Lady Laura Bush, and many other globally notable speakers. Break out sessions lasted for three days and covered everything from polishing up club websites, to increasing membership, learning about RI Foundation Giving, and dozens of other topics. It wasn't all work though! The Hinsdale crew got away for a wonderful group dinner at the Nove Trattoria Italian restaurant in MidTown Toronto,(see left) and also attended a great event at the Toronto Lawn and Tennis Club sponsored by the Rotary Club of Toronto Eglinton, Tom Norton's old Canadian club. All and all, a super event in a booming North American city! Riding the Rails in the Toronto Subway System...otherwise known as the "Red Rocket"
A hundred children left the Community House with a new bicycle Saturday morning, in honor of Armed Forces Day and courtesy of the Rotary Club of Hinsdale. All the boys and girls, ages 3 to 9, are children of Illinois men and women serving in the military. Twenty-five boys and 25 girls, age 3 to 5, received a 12-inch bicycle and 25 boys and 25 girls, age 6 to 9, received a 20-inch bicycle. They all also were given a bicycle helmet. 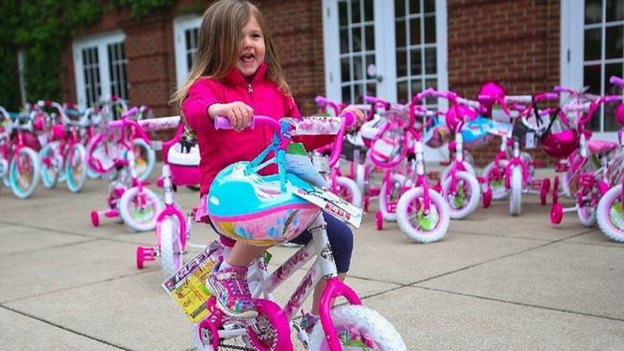 The USO of Illinois last year donated 100 bicycles to children of military families and saw they could have given away many more. 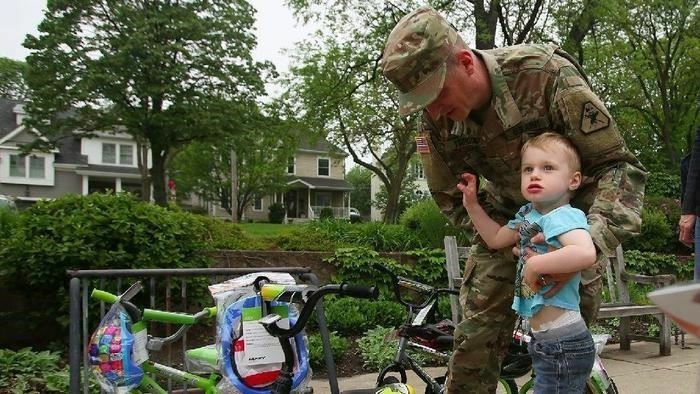 So this year, the Hinsdale Rotary Club decided to partner with the USO and pay for the bikes, said Tom Norton, a Hinsdale Rotarian and a USO volunteer. Norton stored the 100 bicycles for more than two weeks in his garage. “My grandchildren have been lustfully looking at them,” he said. But after he explained who will get the bicycles they were satisfied to just look, he said. Neighbors who have seen the bikes filling his garage asked him if he was going into the bicycle-selling business. The Rotary Club learned buying 100 bicycles at a time was more difficult than they thought. Club members expected to buy the bicycles en masse and have them delivered, but that was not an option. 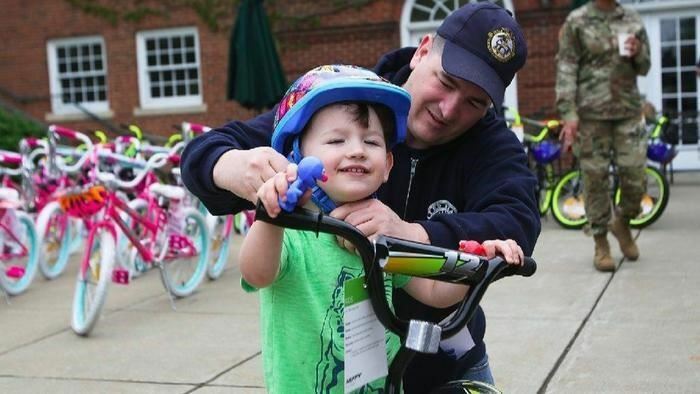 Instead, they bought the bicycles from the Walmart in Darien and rented a truck to transport the bikes from the store to Norton’s garage in early May. That was after Walmart employees made sure the bicycles were properly assembled, with all the bolts tightened and the tires properly inflated, Norton said. The Rotarians rented another truck to take the bikes from Norton’s house to the Community House. And the night before delivery, they double-checked that the bicycles were ready to go, so after the families took them home, the children could get right on and start riding. Illinois Lt. Gov. Evelyn Sanguinetti was on hand to help with the giveaway. 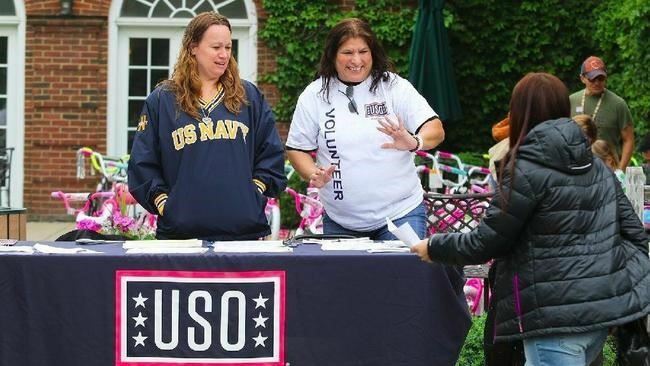 The USO has an online service where it publicizes opportunities and outings for military families. 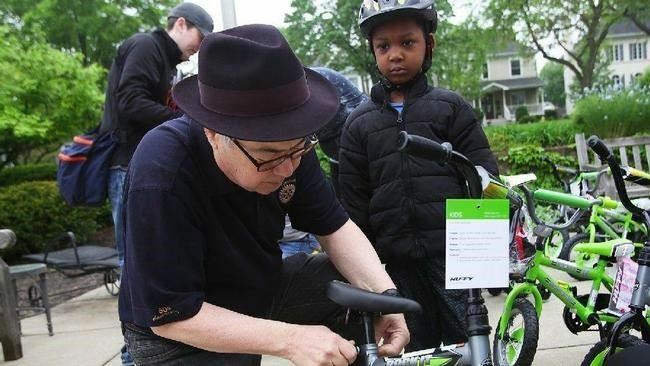 Within two days of posting the bicycle giveaway, 168 families had signed up, Norton said. At that point, the USO cut off registration and chose which of the 168 families would get a new bicycle in a random lottery. The USO reports about 25,000 active military personnel live in Illinois and about half of them are married, Norton said. 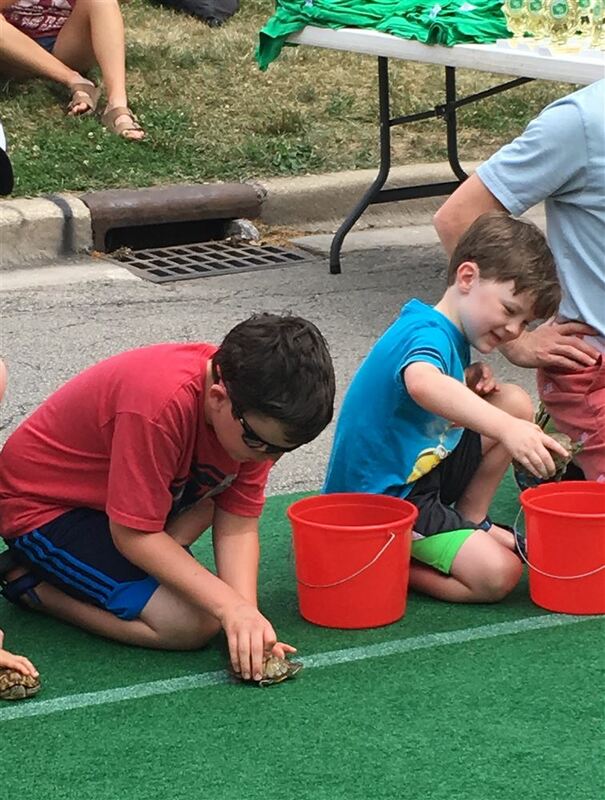 The Rotary Club invited all the children who received a bicycle at the Community House to march and ride with them in Hinsdale’s Fourth of July parade. 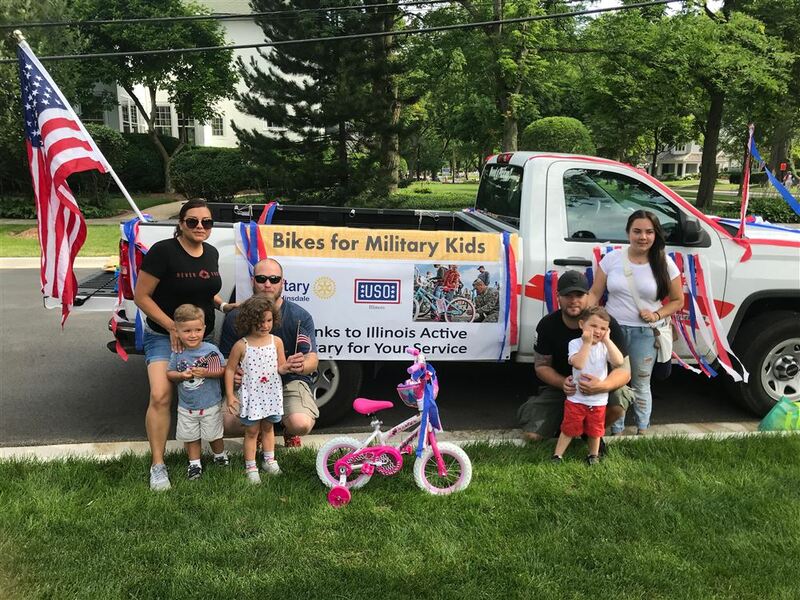 Our thanks to USO of Illinois for coordinating "Bikes for Military Kids"! 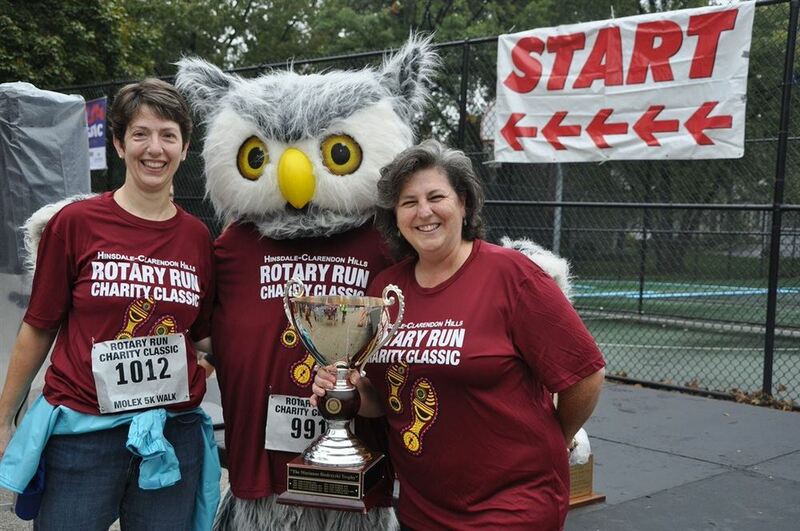 (L to R) Oak School Principal, Dr. Martha Henrickson, “Hooty” the Oak School mascot, and Marianne Biedrzycki (“Mrs. B”) during the awarding of the “Mrs. 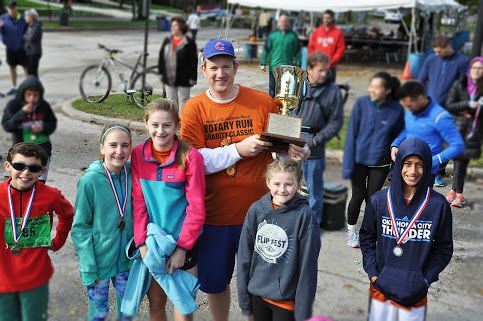 B Trophy” during the 2016 Great Rotary Run in Hinsdale. Marianne, known as “Mrs. 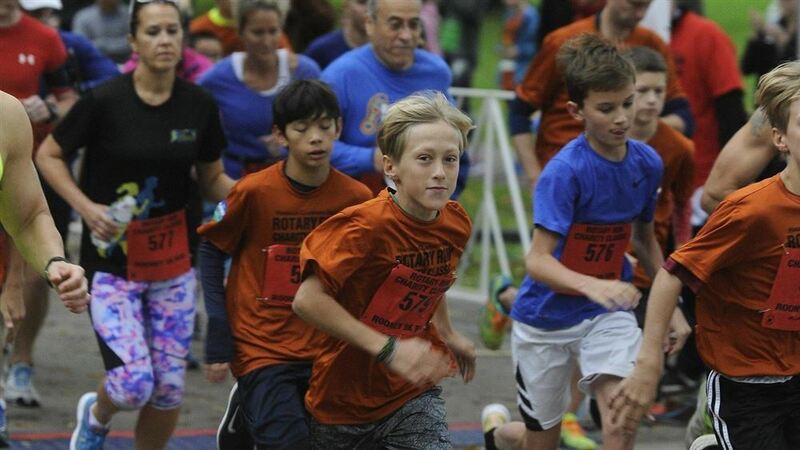 B” to her District 181 students, for the past 20 years has encouraged her elementary school classes to participate in the annual community race. 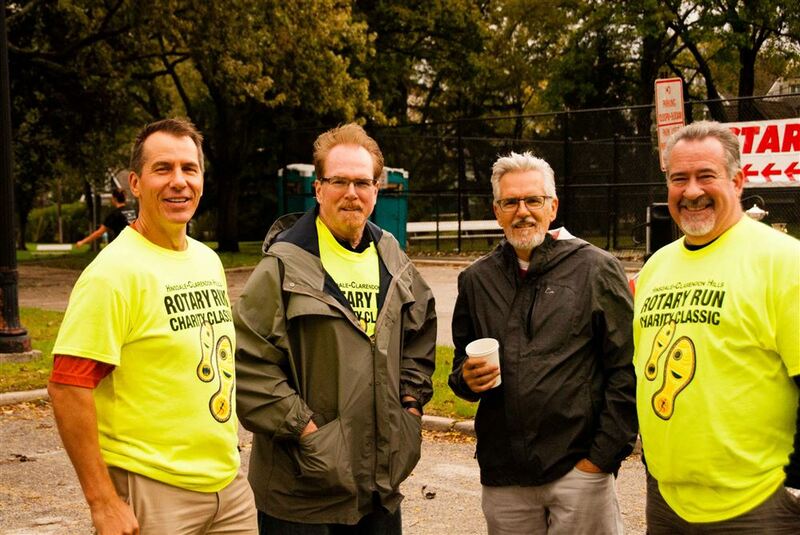 During those years, the race has evolved into a major Hinsdale Rotary Club “family fall event” designed as a fundraiser for not only the Hinsdale Rotary Foundation, but also for The Community House of Hinsdale, The District 181 Foundation, The Ray Graham Foundation, and the Hinsdale Hospital Foundation. 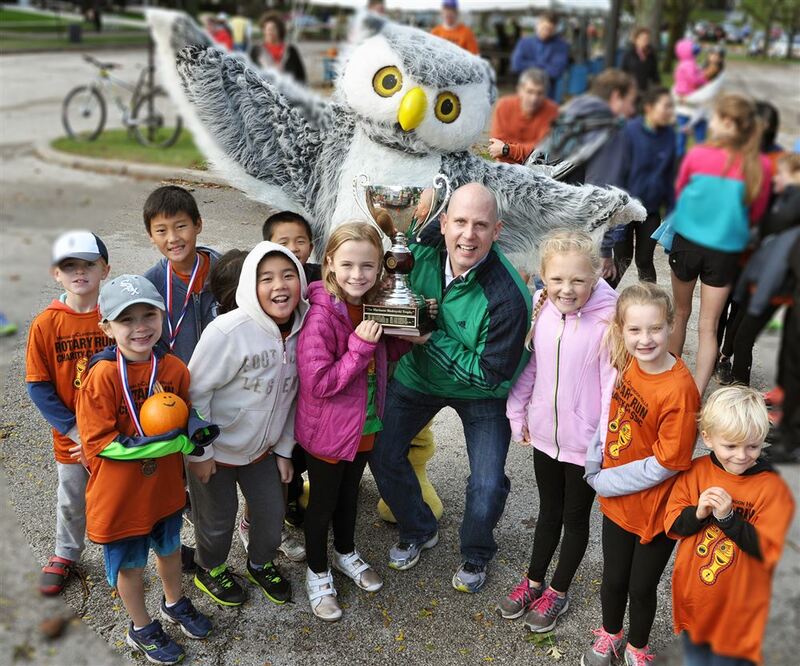 Back in 2011, it was decided that the trophy awarded to the District 181 school that not only registered the most runners, but actually turned them out to run in The Great Rotary Run of Hinsdale, should be named “The Mrs. B Trophy”. This was done to honor Marianne for her years and years of dedicated effort on behalf of the race and her undying devotion to the community in which she works. 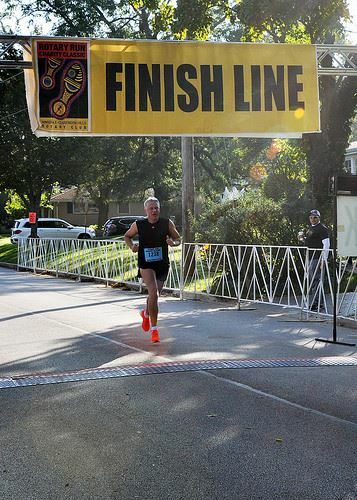 “Initially I felt the Great Rotary Run was a fun way to culminate my fitness unit and to participate in an important community event,” Biedrzycki said, who got involved with the run as a PE teacher at Monroe School back in 1998. 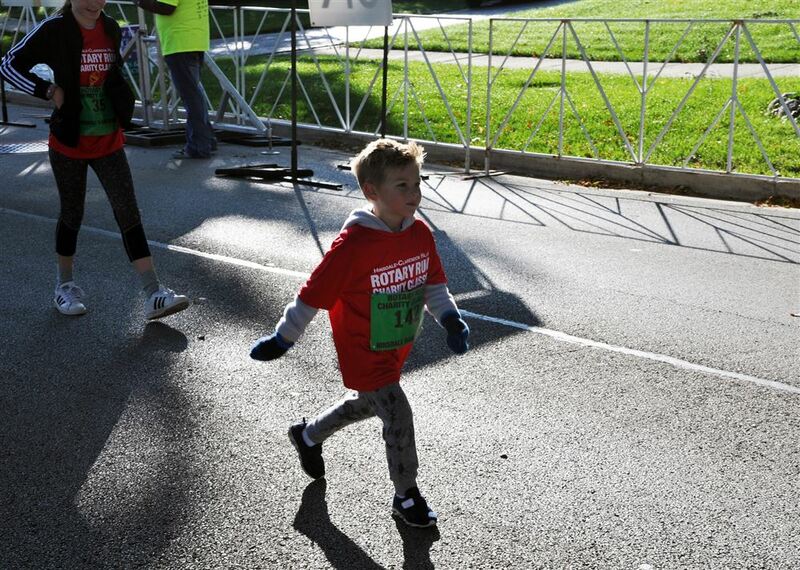 “As the run got bigger and bigger, the kids liked it, more and more” she added. “To this day we’re building teams, touching lives and trying to win that “Mrs. B” participation trophy. Take advantage of the new, low, discounted registration fees as you help the Hinsdale Rotary Club honor “Mrs. 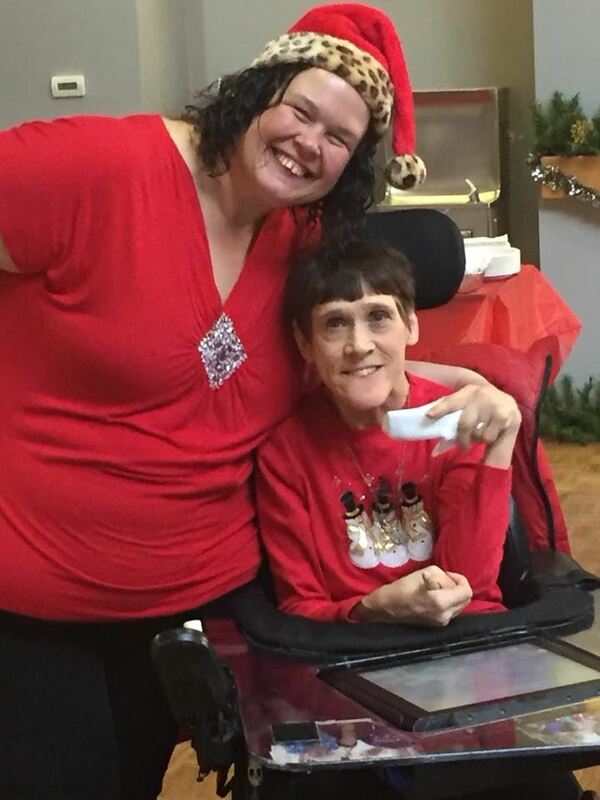 B” and her 20 years of service to the community. Congratulations from Hinsdale Rotary to Marianne Biedrzycki! See you on October 14th! 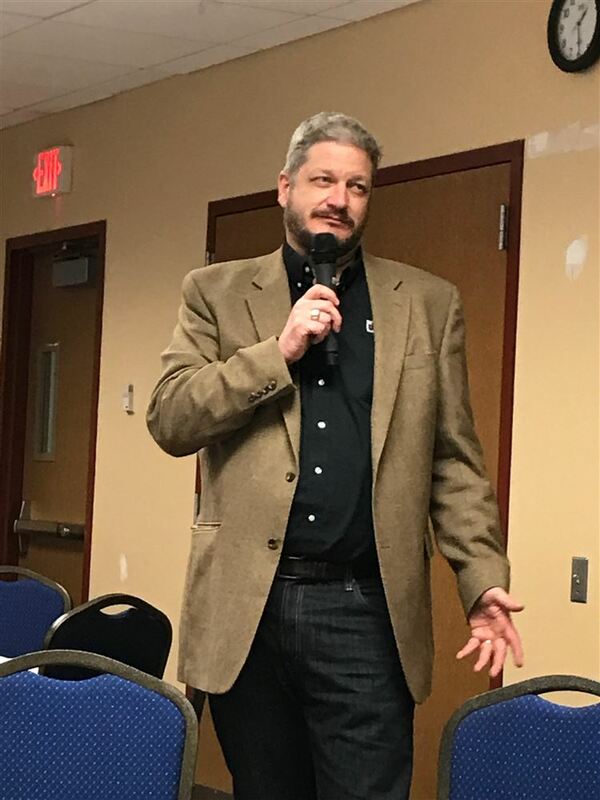 Tom Van Winkle, newly appointed Executive Director of the Hinsdale Humane Society, spoke to the club on the new direction of that local non-profit. He detailed the rehab of the old Crown Center that will be completed by next fall, offering a completely new Hinsdale Humane Society facility to the community. Van Winkle stressed that the new center is an "area" humane society, taking in animals from at least eight neighboring villages, as well as accepting animals displaced by floods, hurricanes, and even the California fires. Craig Anderson, Executive Director, Illinois High School Association, presented a wide ranging program addressing Illinois High School sports and many activities that are sanctioned and managed by the IHSA. Anderson also addressed controversial areas of high school sports today such as football concussions, "single sport" athletes, and how IHSA is managing social issues such as transgender athletes. 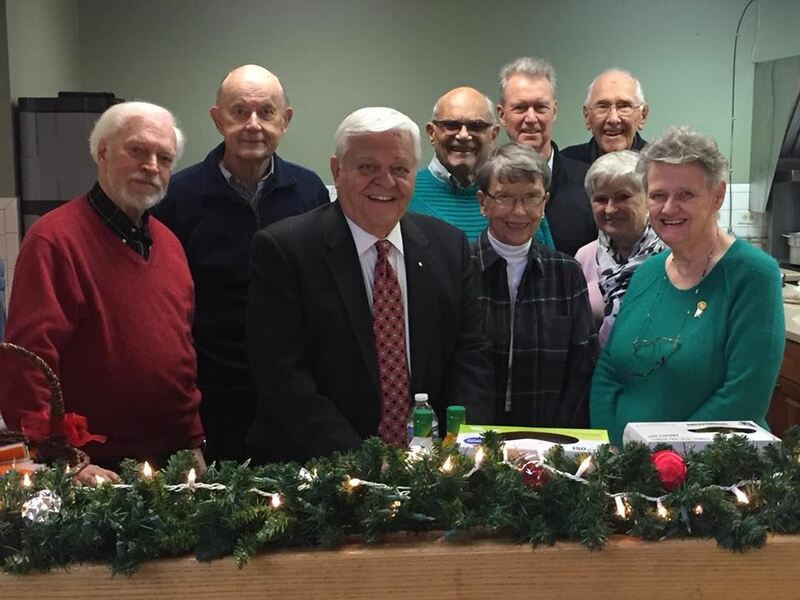 Hinsdale Rotary provides an early Christmas Celebration and luncheon for Hanson Center class, including caroling! 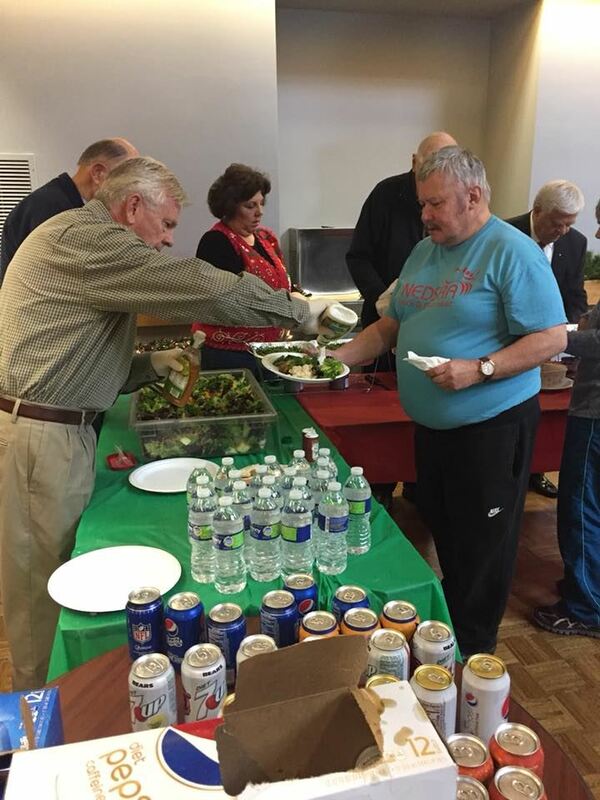 Hinsdale Rotary team serving lunch The team that made it happen at the Hanson Center! 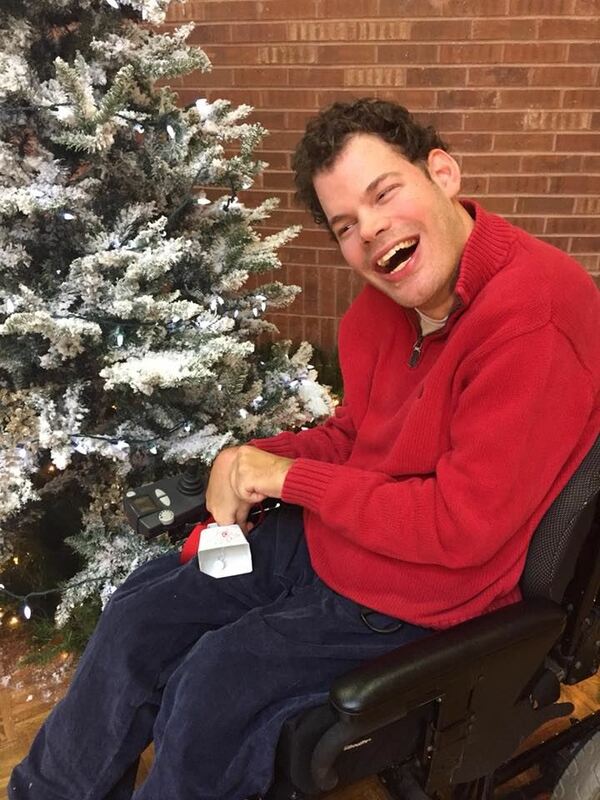 Christmas Comes Early at the Hanson Center! The Ray Graham Association’s Hanson Center, located in Burr Ridge, is home to the Therapeutic Horsemanship Program. The program utilizes over 20 therapy horses to help children and adults with developmental disabilities, wounded veterans and those challenged with issues such as anxiety and traumatic brain injury. 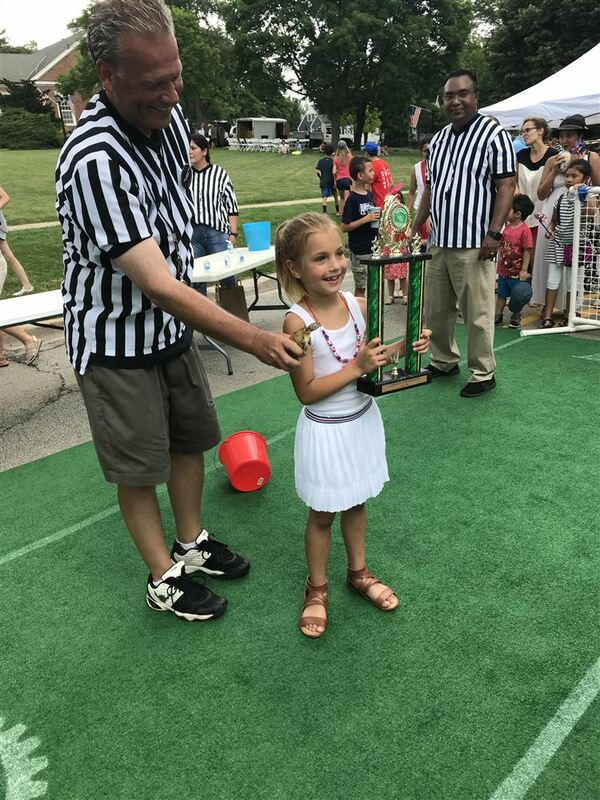 Over the years, the Hinsdale Rotary Club has made countless gifts to the Hanson Center and in the past few years started hosting three parties each year for the people supported there and the staff. The club’s generosity doesn’t stop there. 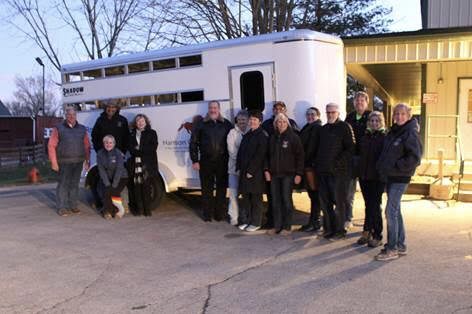 Christmas came early this year in the form of a new three-horse trailer donated to the Hanson Center by the Hinsdale Rotary Club Foundation. The Foundation does charitable work both locally and internationally. Funding comes from individual Rotarians, donations from the community, fundraising events like the Hinsdale Rotary Run each fall, and grants. 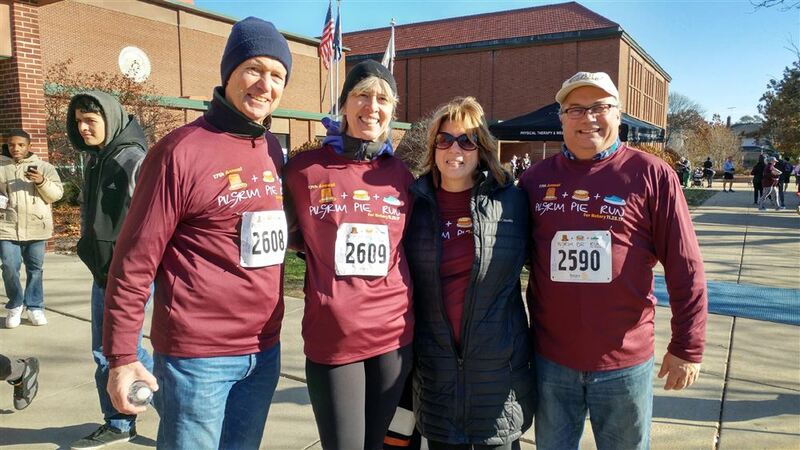 Nov. 23rd, 2017 - Tom and Erin Norton; and Char and Keith Larson run/walk in the LaGrange Rotary 2017 5k "Pilgrim Pie Run" on Thanksgiving Day. Everyone got a pie! 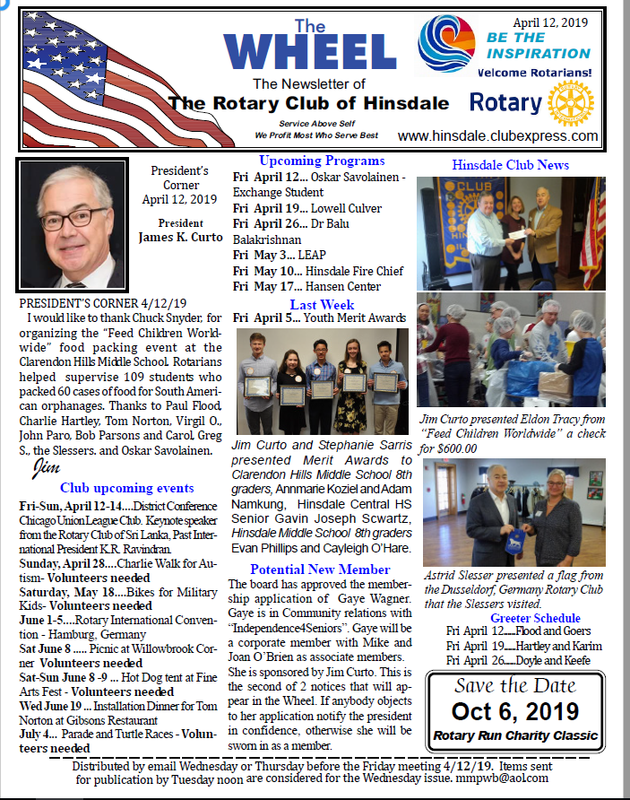 Hinsdale Rotary welcomed Ugandan Rotarian, John Mulindabigwi, who is involved in a number of Rotary projects in Uganda, and Mike Trout of the North Lawndale community to our weekly meeting. 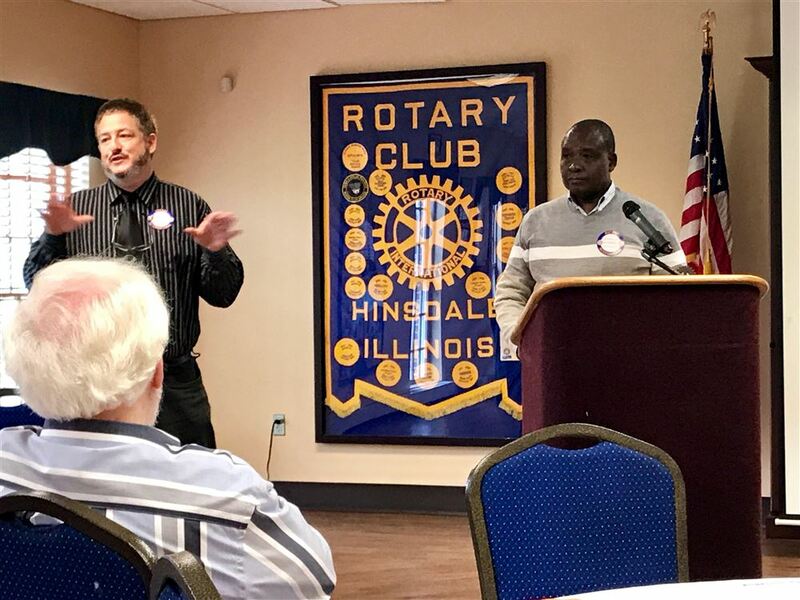 The pair spoke about several educational, sanitation, and industrial projects that Mr. Mulindadigwi has headed up for the last ten years in Uganda with assistance from Illinois Rotary Clubs and local West Suburban churches. The 23rd Hinsdale Rotary Run Charity Classic Race, a CARA certified annual event, brought participants, spectators and hundreds of volunteers out for the Morgan Stanley 10K run, the Rooney 5K run, the Molex 5K walk, the Hinsdale Bank & Trust 3K run, the Birches Walk & Stroll, the Mutt Strut, and the Hinsdale Grade School Mascot Race to the historic streets of Hinsdale and beautiful surrounding neighborhoods before returning to The Community House at 415 West Eighth St.
A wide variety of family activities were featured on the grounds, including: an awards ceremony, pumpkin decorating, vendor/sponsor booths, music and refreshments. The result link on this website rotaryruncharityclassic.org takes you to all of the race results. 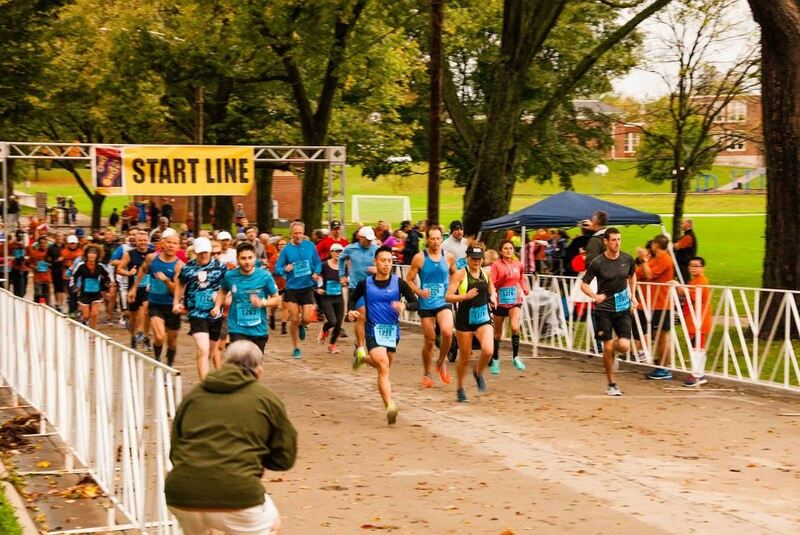 The start of the RRCC 2017 10K race! Oak School wins the "Mrs. B" Trophy! There were over 500 runners and walkers, from 40 communities who pariticipated. 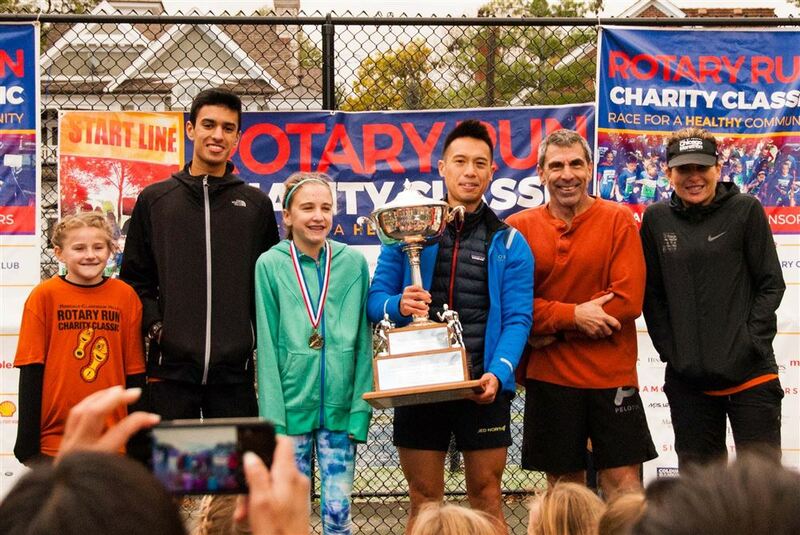 District 181 schools continued their long-standing tradition of a friendly competition for the highest percentage of student and staff Rotary Run event registrants. 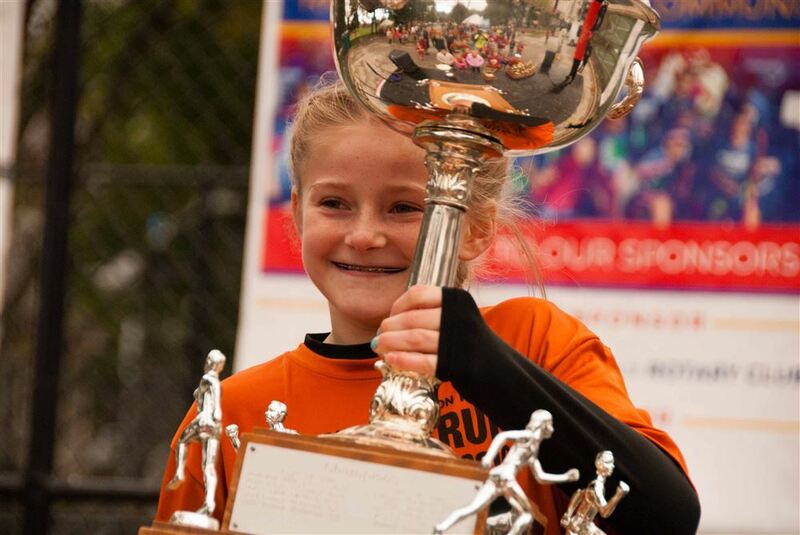 Hinsdale Middle School won the "Mr. K Cup", and Oak School won the "Mrs. B Trophy". 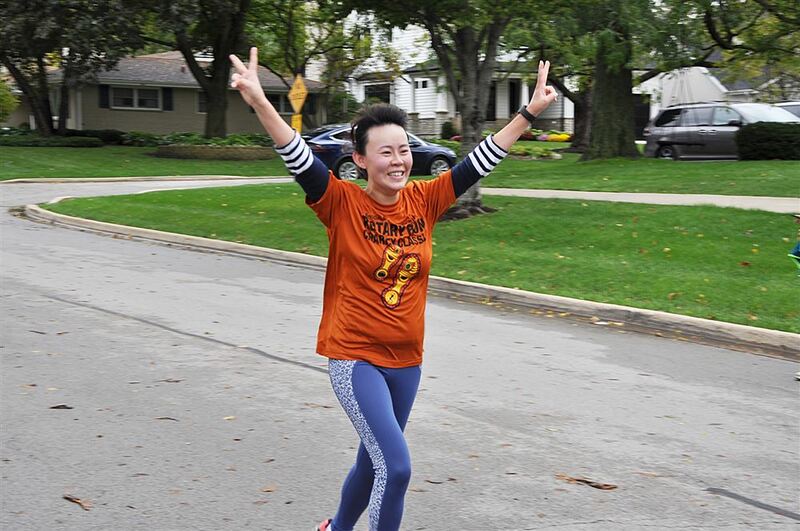 The 23rd annual Rotary Run Charity Classic, which raised over $70,000 for charity, partnered with AMITA Health Adventist Medical Center, Hinsdale, making it a true community event. 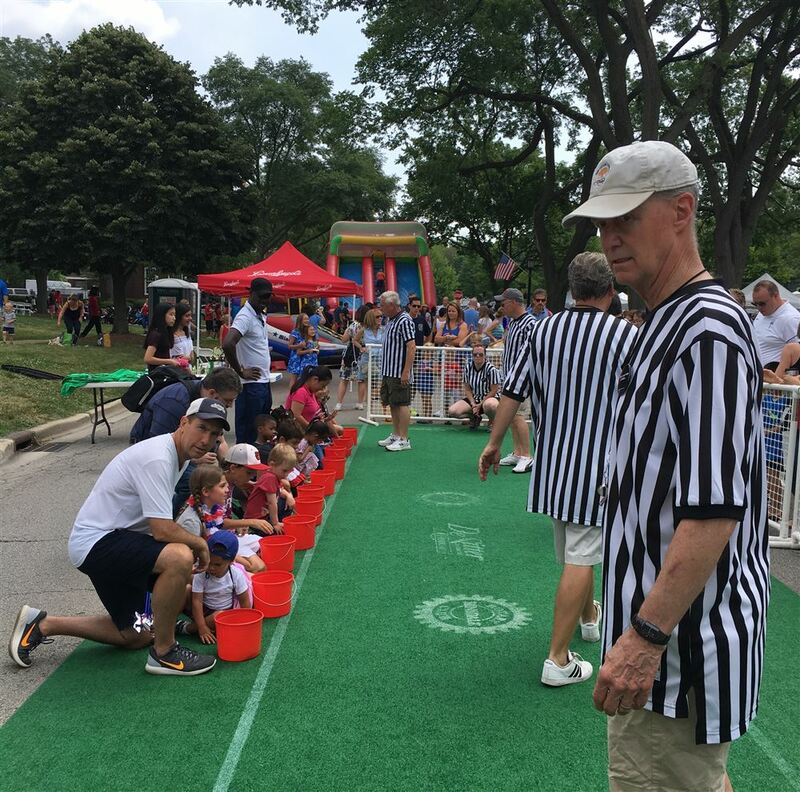 The RRCC benefited some of the most well-known charities in our suburban area including The Hinsdale Community House, Amita Medical Center, Hinsdale, Foundation, District 181 Foundation, Rotary Club of Hinsdale Foundation, Hinsdale Humane Society and the Ray Graham Association- Hanson Center. 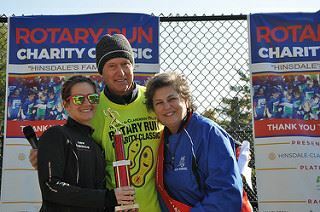 Hinsdale Rotary Run for Charity results can be found here. Hundreds more followed in the 5K, 3K, Mutt Strut, and Rock and Roll races. 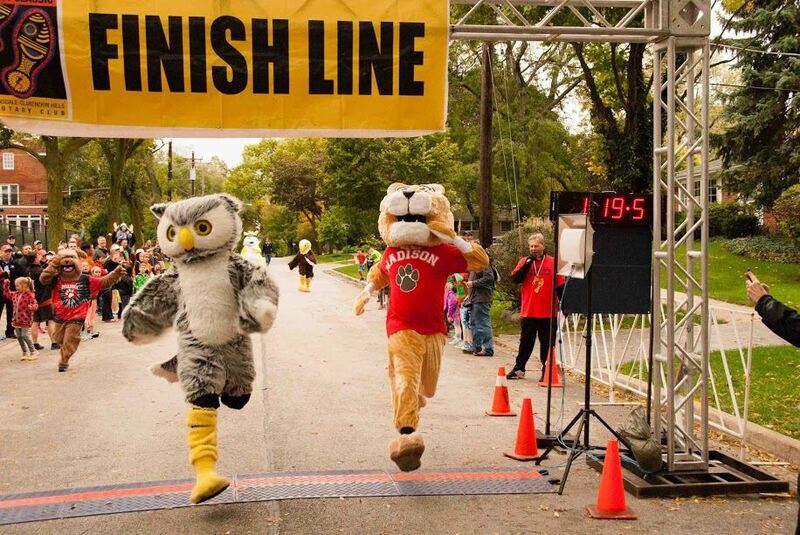 The incredile Hinsdale Grade School "Mascot Race" -- A tie between the Oak School Mascot, "Hooty" and the Madison School Mascot, "Paws"
Hinsdale Rotary thanks the President of the Glen Ellyn Rotary, Ed Scheer, for running in the 10K event of the 2017 Hinsdale Rotary Run Charity Classic! Thanks to everyone who sponsored, volunteered, cheered, and most of all, raced in the 2017 Hinsdale Rotary Run Charity Classic! 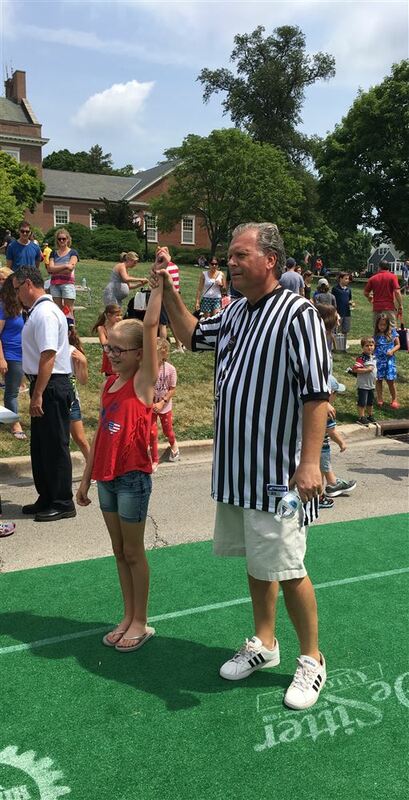 2017 Hinsdale Rotary Race Charity Classic Coordinator and Chairman, Keith Larson, giving a "thumbs up" to all the local Rotary clubs that supported this 23rd running of the RRCC. Seven teachers from the South Africa LEAP Program (http://leapschool.org.za/) came to Hinsdale Rotary to share their personal experiences in being educated in the LEAP schools, and now being able to teach new students in those same schools. 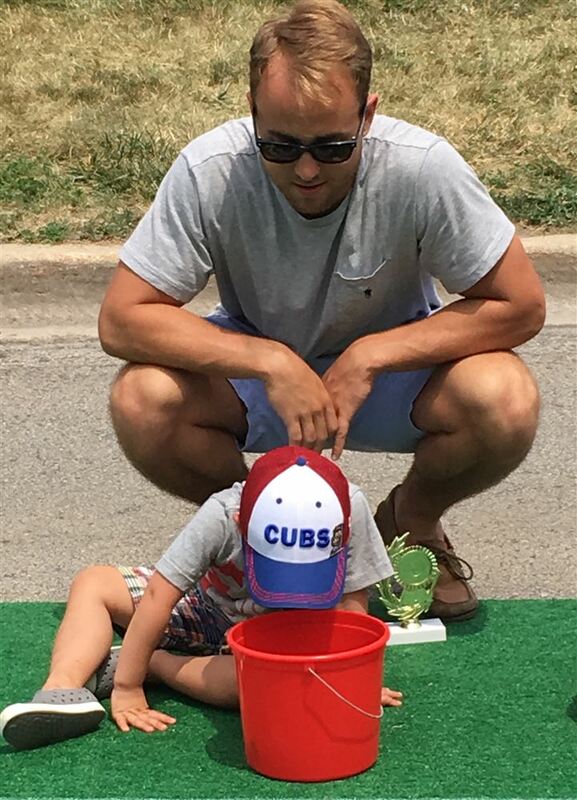 The seven teachers are in Hinsdale visiting Hinsdale Central and spending time with families in the area to gain perspective on American education and home life. Hinsdale Rotary is a proud sponsor of the LEAP Program and will continue to do so in the future. 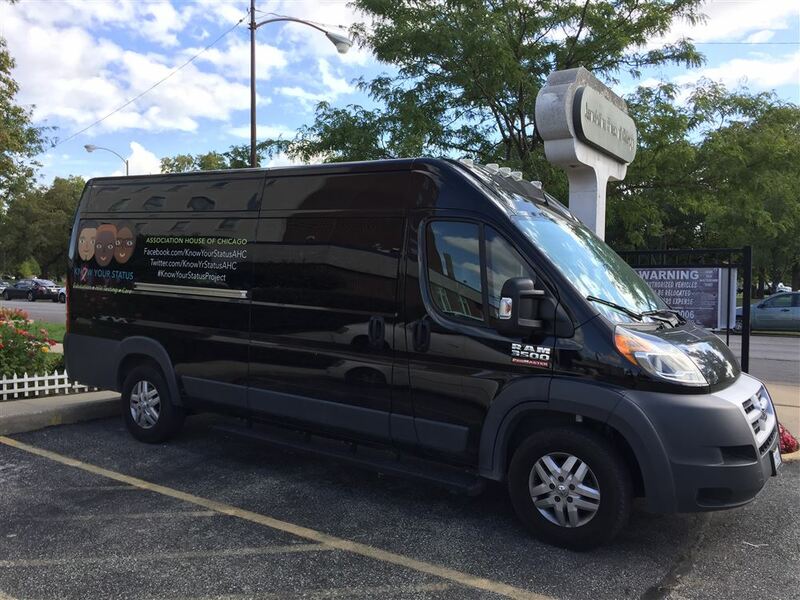 Following the recent District 6450 Conference, Member Bob Parsons obtained a Club endorsement of a project to obtain (business class) airline amenity kits from the Chicago O'Hare Rotary Club for the mobile HIV-Aids testing unit at Association House of Chicago. 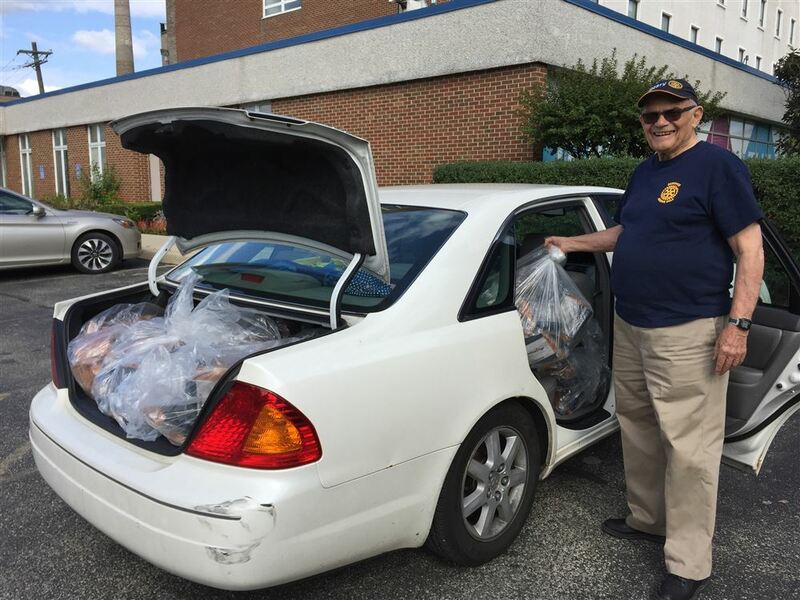 After coordination with Association House and the O'Hare club, on Sept 7th, Bob arranged to pick up 550 plus kits and deliver them to Association House. AS Bob points out, this was a project of, and gift from, the Hinsdale Rotary Club and the O'Hare Rotary Club. This should be a 6 month supply for the Association House. Bob Parsons delivering airline amenity kits to the Association 550 kits were delivered. A 6 month supply! 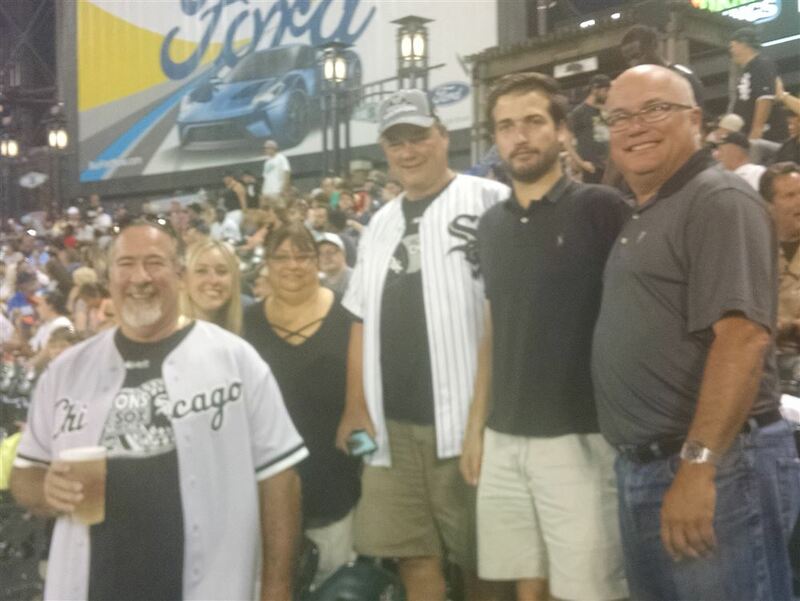 The White Sox lost 8-4 to the Toronto Blue Jays, but it was a night filled with fun and Rotary fellowship...Don Brummet and Keith Larson with family members and friends, and Tom Norton with wife, Erin. 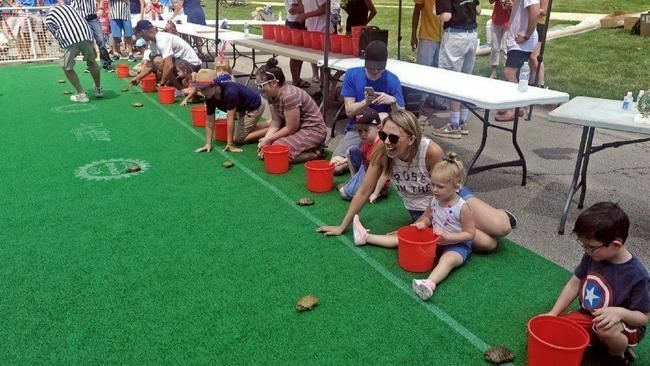 Eleventh Annual Hinsdale Rotary Club Fourth of July "Turtle Race", 2017 -- A Success! 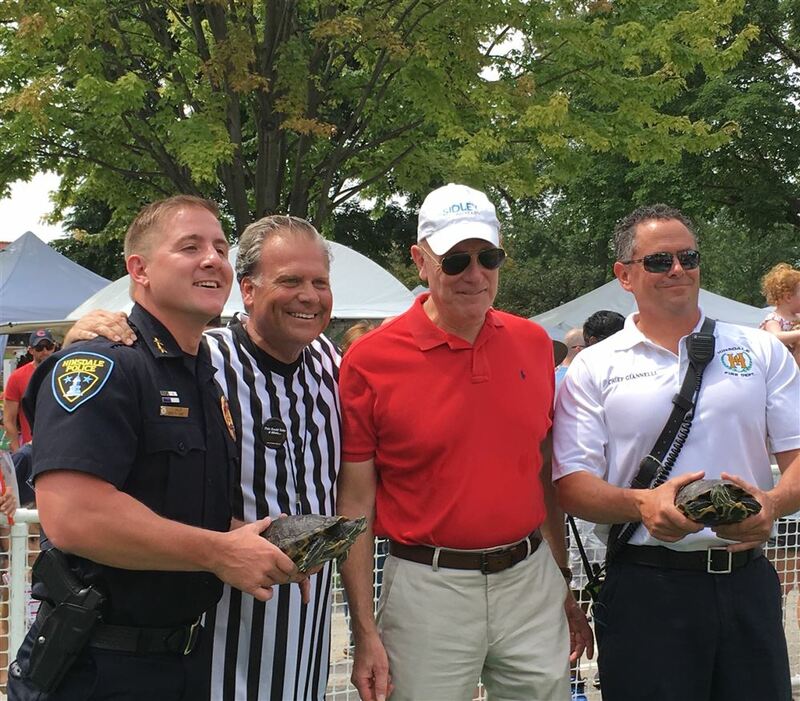 250 kids raced 30 turtles...And once again, the Hinsdale Police Department turtle, beat the turtle from the Hinsdale Fire Department. 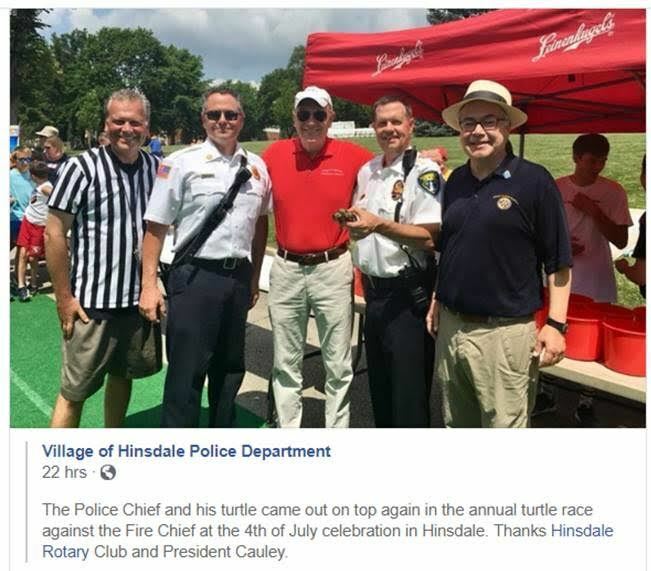 Village President, Tom Cauley,(in red shirt) called the race along with Rotary Turtle Race coordinator, Greg Donnelly, between the two Hinsdale departments. Incoming Hinsdale Rotary President, Tom Cunningham, and club members Carolyn and Chuck Snyder attended the Atlanta event. 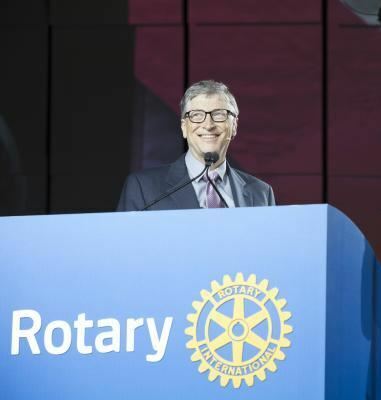 Nearly 40,000 members of Rotary – a global network of professional and community leaders committed to improving lives and bringing positive, lasting change to communities around the world – convened this week in Atlanta, GA for Rotary International's organization’s 108th International Convention. 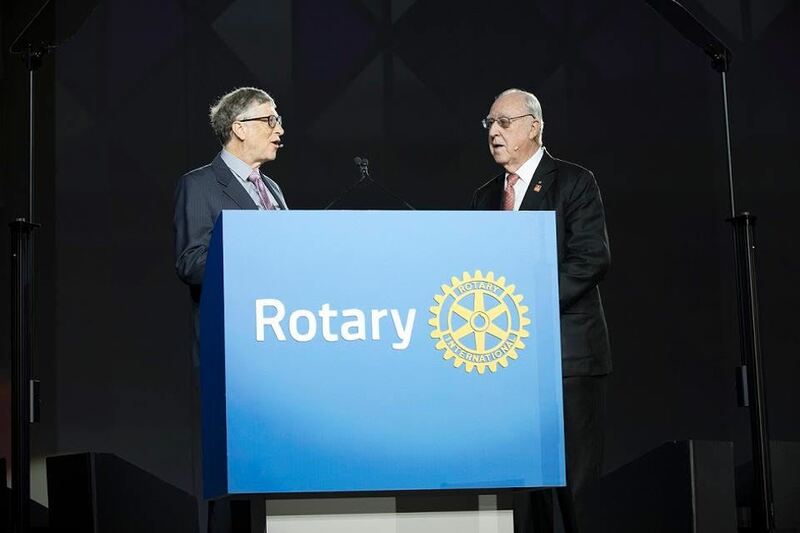 As noted above, Bill Gates once again, through his significant financial and moral support, got behind Rotary's Polio Eradication Campaign--100%! Nicki Scott leads Hinsdale Rotary Board through a strategic planning session for the 2017/18 year on June 6th. Members described the session as very useful to determining club goals for the next year. 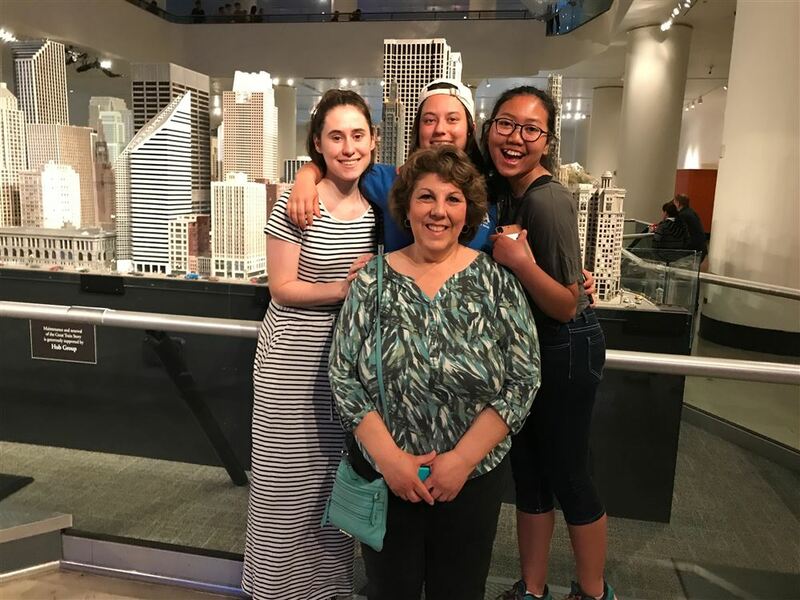 Ashifa Primardhika, Indonesia; Paula Patino, Mexico; Chloe Tirard, France take in a day at the Chicago MSI. They were accompanied by Hinsdale Rotarians Cheri Vana, District Coordinator for Rotary Exchange students, and Tom Norton. 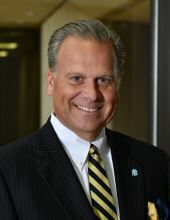 Donations in Greg’s memory may be made to the Hinsdale Rotary Foundation and may be mailed to P.O. 395, Hinsdale, IL 60521.